A few months ago I came across some photos of an IKEA hack so absolutely brilliant I knew I had to do it myself. The VITTSJO shelving unit is a play on an image I pinned a LONG time before we planned to move and was part of my "someday" home file. When I found the hack it just seemed to good to be true and like it was meant for me to find, then the shelves went on sale in March (for IKEA Family members - which I am....duh) and it was like the universe was trying to send me a message. 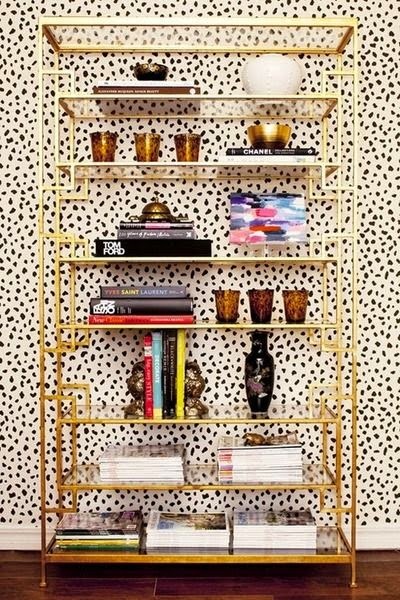 After debating on whether I wanted double or single shelves my awesome hubby put them together late one night and Sweet Pea and I spent the weekend spray painting them gold. For some reason mine came out more of a burnished bronze gold than bright brilliant gold but it works because I have a golden lamp that matches perfectly. No complaints here. The next step was to style them. We have a lot of books. Like a LOT and they are an interesting variety so it was my mission to make them 'work' in this collective space while incorporating framed photos and other knick knacks we've had laying around the house with no home. 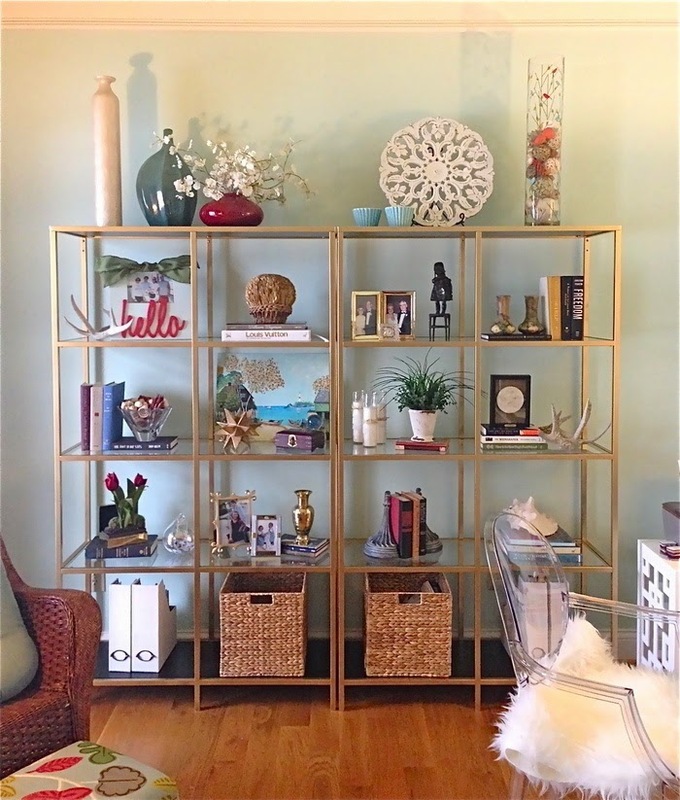 I pinned a great post about styling a bookcase last year and it was semi helpful but because these aren't exactly bookshelves and are wide sort of "floating" it didn't all apply. I started with the basics - books and accessories. I knew I wanted to put words and other kitschy items on display so I added those in next. Then I went through our frames and kind of threw them up there knowing I would come back and revamp as I saw fit. So far so good. HomeGoods will be my next stop as they always have a TON of decorative accents that I'm always drooling over but never had a reason to buy (like I really need one) or a place to put them. Now I do! Because the walls are very plain I wanted to layer in pops of color on the shelves so I chose accents in varying but complimentary shades to bring warmth to the room. Also, because this is a shared space with the dining table it has to all work together for one cohesive look while still being two separate vignettes. I kind of love it so far. The shelves seemed huge when we first put them up and then once I started filling in the blank spaces it began to just make sense. Putting the picture on the wall above the mantle creates some symmetry and I can't wait to add a nice cozy rug to really complete the room. I also have big plans for the chairs to be reupholstered but am sweating choosing the fabric. I want something fun that works in the room and for our lifestyle. And also that when I show my husband he doesn't raise his eyebrows at me. But we'll see how that goes. How did you come up with the style for your rooms? 2.) Layer, layer layer. Normally we talk about layering clothing but here it applies to books, frames and decorative accents. Prop them up against each other, on top or in front of. You'll be surprised at how much depth you can get when you layer. 3.) Play around with sizes and height. Everything does NOT have to be the same scale. You actually want your pieces to be different sizes so as to draw attention and create interest. 4.) Be unique. Choose items you already own (like that lopsided ceramic vase your kid painted in pre-school) mix in more trendy items (horse heads/ owls/ pineapples etc.) with a few fun quirks and antique pieces to make it your own. 5.) It doesn't have to be "perfect". We all fret about having things look 'just so' or like they were styled for a magazine and that's just not real life living. Do what works for you and if it feels like it's done then let it be done. If not, don't stress or give yourself a time frame for completion just walk away and come back to it. It's a shelf. It's certainly not going anywhere.